The Iowa Great Lakes Trail winds through rural, urban and natural areas in the heart of the Iowa Great Lakes Region. Over 100 miles of trails in Dickinson County provide residents and visitors a safe place to bike, walk, rollerblade, run and cross-country ski. 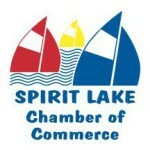 Spirit Lake has over 10 miles of trails in the City, connected to the county trails system. For more information, contact the Okoboji Tourism Committee, 243 W. Broadway, Arnolds Park, Iowa 51331, or call 800-270-2574.